SHOPPERS in Salisbury may have spotted some strange shenanigans going on at Salisbury Cathedral on Thursday. 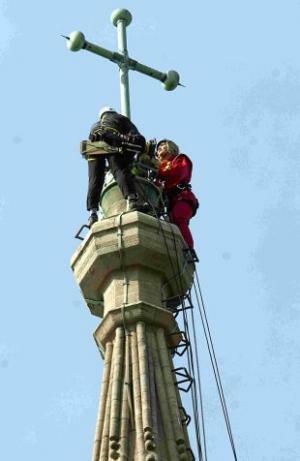 Blue Peter presenter Helen Skelton was joined by a steeplejack and an abseiling camerman to change the four red light bulbs on the spire. The group climbed up inside the spire to the weather door, which is 12 metres below the summit and is the point at which they had to continue the climb to the top on the outside.